After spending some time in England and Scotland this summer, I have developed quite a taste for black tea with a bit of milk and sugar. And since English Breakfast is what was normally served over there, that is the exact tea that I want to drink at home. 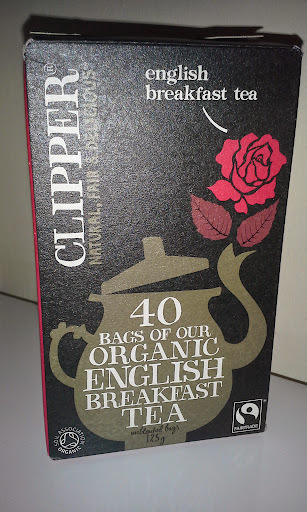 Though I have tried other English Breakfast brands, this one from Clipper just might be my favorite. It is organic with the only ingredient being the black tea, which is just how I like it. The tea bags are not bleached white, which is also something that is important to me. As with most black teas, the flavor of this one is quite strong and robust. And when you add in just a little milk and sugar, it really shines. Don’t get me wrong though, it also tastes great just plain with nothing added to it at all. One important thing that you should know is that when you buy the larger box like I did (see the photo), then the tea bags are not individually packaged. Instead, they are all in a type of plastic together in the box. So when you open it the first time, there is no real way to seal it back up other than to fold over the top of the bag. I’m not certain if air exposure does any harm to the flavor of the tea, but if you drink it rather quickly like me, then it might not matter as much to you.